Black bean sauce is super dear to my heart because it possesses this salty, fermented flavor that is reminiscent of so many Chinese dishes. In a Chinese restaurant this ingredient would be mixed with a ton of cooking oil and a really high flame, to make any dish greasy as hell, and packed with flavor. Prior to being Vegan, I would often order a black bean sauce chow fun (wide-flat rice noodles) with chicken, but I would never make it at home because the dish was so accessible anywhere in San Francisco. Now that that’s all changed, I feel much better controlling every ingredient that goes into this dish and making it my own. I’m in love with all types of rice noodles, but rice udon noodles used in Vietnamese cuisine, really take in a lot of flavor and don’t stick a whole ton to a Wok at home, which is golden. Whenever I cook, I always think about what needs to be prepared first. This is fairly fundamental, but I feel it needs to be mentioned as we’re prepping all the aromatics, bell peppers, mushrooms, and mixes. This makes it really easy to quickly toss into a high heat Wok. You definitely don’t want to be scrambling around for stuff when the oil is ready to go! I like to take the aromatics and swirl it around the oil to coat the Wok first. Since we have bell peppers going, it’ll be important to let these cook for a couple of minutes before we add in our shiitake mushrooms. Shiitakes will elevate any plant-based dish with its meaty, smokey, and earthy tones. When we add in the mushrooms, it’ll be important to make sure they brown a little to give them a good texture. After all prep work is done, we can focus on the noodles because they only take a couple of minutes to boil until they float, so you don’t really need to be multi-tasking during this time. Rinsing them under cold water will stop the cooking process and make them stick less to your wok when it’s time to stir fry them. As we wait for the noodles to dry for about 5 minutes, we can start on the soy mixture which consist of equal parts, tamari & dark soy, with a little sugar and sesame oil. After about 5 minutes, we’ll heat the Wok up on high again with a touch of oil, throwing in the remaining aromatics and noodles together. Let the noodles sear for about a minute and then evenly coat the noodles with the soy mixture we just made. After a minute of quickly browning the soy sauce into the noodles, you’ll want to create a small center pocket to heat up the black bean sauce and water mixture. 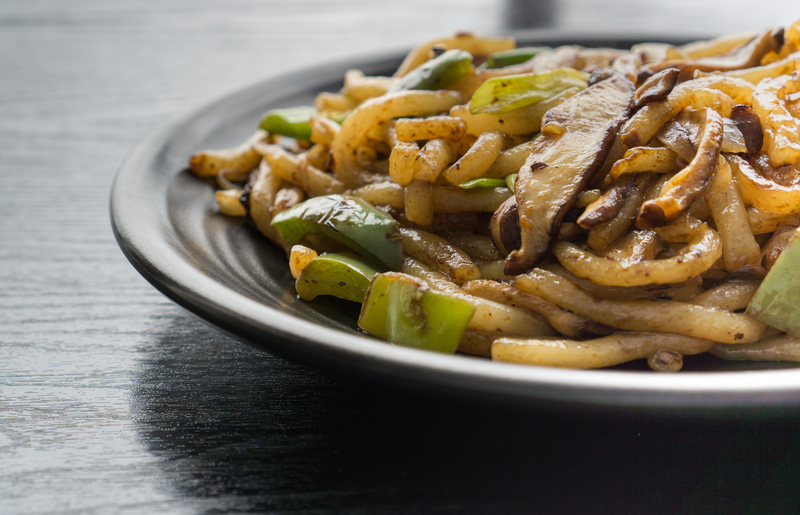 When you see the black bean sauce starting to bubble, it’s time to quickly toss and combine the mushrooms and bell peppers with the noodles and give everything a flip. You can use tongs for this if you prefer, or just a Chinese wok spatula if you have that. Sear and flip for about 2 minutes making sure everything is piping hot. You’re ready to plate and enjoy! A traditional black bean sauce stir fry flavor with a vietnamese inspired noodle. Awesome for lunch. Prepare Soy Sauce Mix by combining Tamari, dark soy sauce, sesame oil, and sugar into a small bowl. Add 1 tbsp of oil to Wok and swirl until close to smoking point. Throw in 1 garlic, 1 slice ginger, 1/4 onion slices, and bell peppers. Cook for 2 min then add shiitake mushrooms and cook until nicely browned. Set initial ingredients aside. Boil noodles until they float, about 2-3 min. Once cooked, strain and rinse under cold water. Allow to dry for 5 min. Heat 2 tbsp of oil in Wok and add remaining onion, green onions, garlic, and ginger with noodles. Add shaoxing wine to rim of wok and toss until noodles are evenly heated and seared for 1 min. Evenly coat noodles with Soy Sauce Mix and let fry for 1 min. Create small pocket in the middle to head up the black bean sauce and mix with noodles.